If it isn’t obvious already I lost my faith in the religion of my birth. On my way out I questioned the existence of God. This was actually pretty natural for me given that the church I was part of claimed to be the only ‘true’ church on the face of the earth. Others had part of the truth, but mine I was sure was the only one that had all of it. Or so I was taught. When I studied my religion I learned very well how to see the fallacies of doctrine that existed in all other religions. I was pretty good at proving them all false. After 40-some years of being so sure I was in the right religion I used critical thinking to question what I had been raised in and believed whole heartedly. I had a testimony based on spiritual witnesses that it really was the only true church. When logic failed to prove truth I questioned the origin of those witnesses and how to rely on them as an indicator of truth. This led to questioning the existence of God and an experiment where I picked the silliest thing that came to mind to pray to and see if it could answer prayers. For whatever reason this happened to be the fridge. The results of that test proved to me that the Fridge was just as powerful a God as any other one I had heard of or had been familiar with in my experience and investigation. To me this was a great insight into the human condition. It was also very humorous. If the Flying Spaghetti Monster can gain followers, then why not the Fridge? Just because pirates created the FSM and so many smart people follow that religion in jest, fun and search of pasta doesn’t mean it is the only true fake religion on the planet! First doesn’t make right, and neither do the amount of followers, this is well explained in all the scriptures we have. 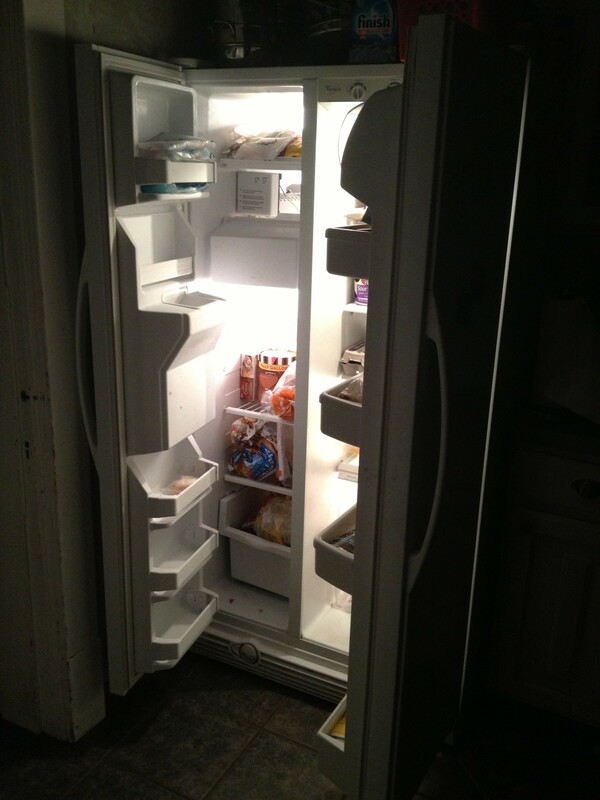 Truly the Fridge gives light in the darkness, it provides sustenance and quenches your thirst! Any parent has seen a child staring into its depths pondering the mysteries therein. 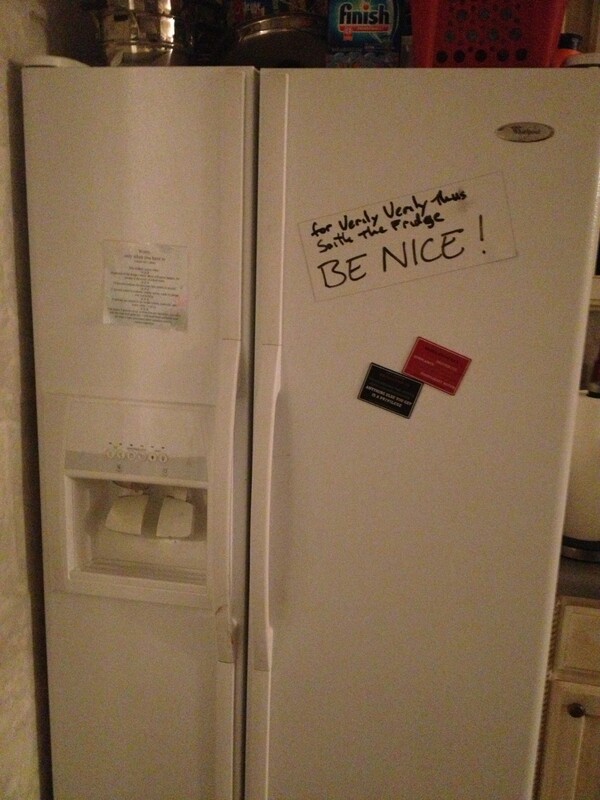 Fridges stick to magnets and often display truths right on the face of them for the whole family to learn. Even the pastafarians must recognize that while pasta feeds you now in the moment that the the Fridge is used to preserve the pasta for future generations to feast on. Truly the power of Freon is great with the Fridge! Someday even the pirates of the FSM will acknowledge this lest we declare a holy war of epically pretend proportions! Feel the Chill brethren and sisteren, every goose bump testifies of the power of the tall cool one! 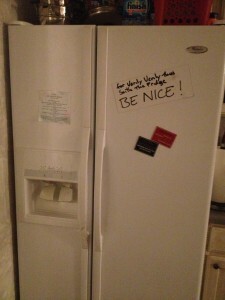 Every time you use ice to heal a bruise you know the Fridge cares for you. Have faith in being nice, find power in myth. Open the door and let the light pour forth till it fills your soul with wonder and humor. Life is meant to be-lived, not just believed. You are right! I once had a really bad day and was even afflicted with horrible stomach pains. I went to the fridge and it healed me! I felt so comforted and that comfort was real.